Christina Arnold of the Grand Rapids Community College's Woodrick Diversity Learning Center recently retired as its director. 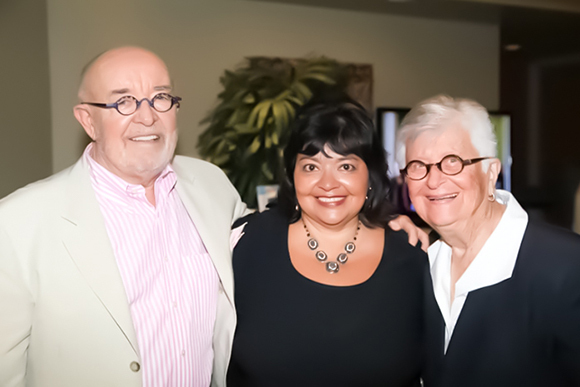 Publisher Tommy Allen sat down with Arnold during the last week of her employment at the college to reflect on the many years she has invested in our community to make it a better place, not just for the students of GRCC but for our entire region. As I listened to Christina Arnold, the recently retired director of Grand Rapids Community College’s Woodrick Diversity Learning Center, reflect on her early years as a child, I began to visualize what it must have been like for her and her six other siblings who, along with their single mom, tried to navigate our city as Mexican-Americans. As she shared stories from her childhood, I kept coming back to her grandfather, Daniel Vargas, who used to take these grandchildren with him on trips to visit our area’s migrant camps, where many individuals who often hailed from their birthplace of Mexico would now reside as temporary farm workers in Michigan. While they visited the camps, Vargas, along with his grandchildren, would deliver items to those working at an area farm and would also offer provide important assistance, like translation services, for this population of primarily Spanish speaking individuals. And yet, while the purpose of these trips was often to attend to the diverse and emerging needs of the migrant community via the many mutual aid organizations that had popped up within our region over time, another reason was so Vargas could assist in his grandchildren’s cultural education. Arnold and her siblings were growing up in a time period of American history during which one’s assimilation in society often translated to a pressure to bury one’s Hispanic culture just to fit in. 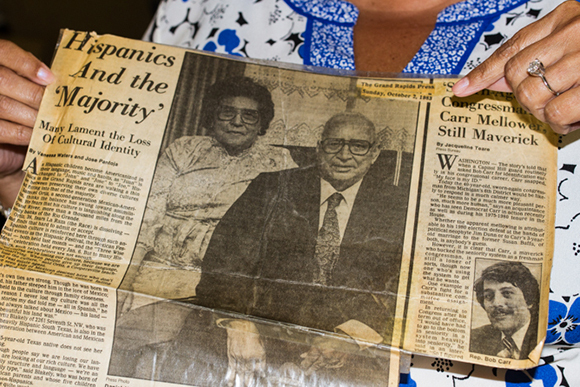 These trips orchestrated by Vargas, according to Arnold, ensured an education opportunity for the siblings to learn why they should be proud of their Mexican heritage. These are some of the earliest memories of Arnold’s childhood in our region. Vargas was so much more than just a grandfather to the young Arnold, who watched firsthand as he built a reputation within our community as not just one of the first Mexican-American families to settle in our region, but as someone who rose up from the farm fields where he once was a migrant laborer to a full-time employee with a local railroad firm. Because he never lost sight of his good fortune in this world, he continued throughout his life to labor in his free time for the rights and improvement of conditions of our area’s migrant workers. As the retiring Arnold continued to share with me press clippings from the white moving boxes that contained remnants and mementos of her former office, it became very clear that the role of others, especially her family, have come to perform a vital role in her education, shaping who she is today. Because of these early experiences within our city, Arnold, after starting working at GRCC at the age of 17, would go on to meet so many leaders from our city over her 37 years at GRCC. Her journey, much like the lessons her family had instilled in her, enabled her to move up from her first position as a student worker secretary to assisting in the setting up of the endowment created by Bob and Aleicia Woodrick that in 2006 would become the Diversity Learning Center, where she served as director since it launched. While at GRCC, Arnold would come to work with so many talented leaders, including Cedric Ward and Elias Lumpkins, who before becoming a Grand Rapids City Commissioner would serve as the Dean of Student Services. All three of these individuals played an important role in moving GRCC’s needle on the topic of diversity and inclusion on campus and also in our community. One of the programs that Arnold helped nurture over time alongside Ward and Lumpkins is the Diversity Lecture Series that is celebrating its 22nd season starting the fall of 2016. “I am most proud of how this lecture series has enabled us to showcase the voices of those individuals from around our world who most often are not heard,” says Arnold of this ever-growing program that has invited speakers like Nicholas Kristof, Ta-Nehisi Coates, former President Jimmy Carter, and so many more. Under Arnold's leadership, this lecture series has grown in size, migrating from those humble, early days where a college classroom would be sufficient room to host a speaker to the more contemporary choice of a neighboring facility, Fountain Street Church — where the capacity is 1,700. Arnold, in seeking to provide more access to these voices, has through GRCC’s media department been able to set up a web archive so that past lectures are available to the online community, thus furthering the DLC’s reach beyond just our city. And while Arnold is proud of the many programs, like the Giants Awards and the college’s annual MLK celebration, she has a special reverence for the Latino Youth Conference — an annual event that seeks to motivate and inspire eighth grade students from West Michigan to continue to pursue higher education and the fulfillment of their dreams. As we wrapped our hour together, I remarked how moving it was to hear her stories of her childhood and the influences they have had on her. What was particularly fascinating during our time together was the need, according to Arnold, to take time in our lives to step away sometimes from what is in front of us because, if we don't, it is easy to suffer burn out. I know what she means but also understand how difficult it is at times. Ever the wise person that she is, Arnold reminds me that the work of justice in our world is a lifelong journey and one that may never be solved because injustice has a way of popping up in areas we think are immune to imbalance. I have no doubt that, in the years ahead, the ever-youthful Arnold will have many opportunities to apply her talents to our community. Her face lights up when she begins to speak of her daughter, Allison. Last Friday at Arnold’s GRCC retirement party, many members of the faculty, co-workers, former students, and community leaders shared heartfelt stories of Arnold’s work and how it impacted their lives. Christina Arnold with her daughter, AllisonBut it was Allison’s tribute that brought tears to Arnold’s eyes. Arnold reminds me that the beauty of our success to which we all strive is most likely tied to another. No person can truly say they did it alone because our history is what informs so much of who we are. 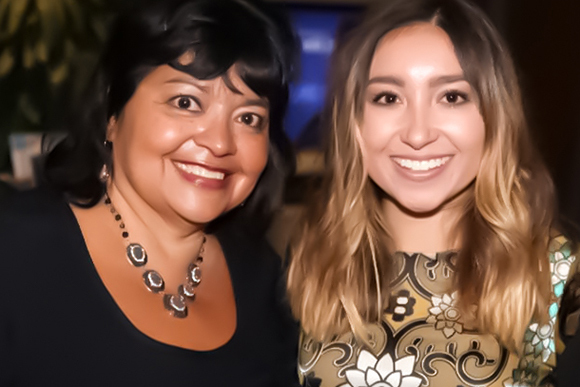 Her grandfather and mother provided a nurturing environment that enabled her to create an even greater impact on our region through the many years of service she has devoted to making room for others. We will all in this city miss Arnold’s leadership at the Diversity Learning Center but will no doubt feel her presence, because while she was at GRCC she made her days count by advocating for ‘the other,’ who often has no voice in our society. Congratulations on an amazing career, Christina Arnold. A grateful city thanks you for your willingness to lead us to a better tomorrow for all. We are a better city because of the many years you have invested in our community to make it a truly grand place for so many others. Your impact may never be able to be truly measured but I am certain it will be felt for generations to come. Publisher’s Note: In 2015, Arnold was the subject of an edition of Rapid Chat. Here is a link to that story we ran on her and more info about the Diversity Lecture Series. 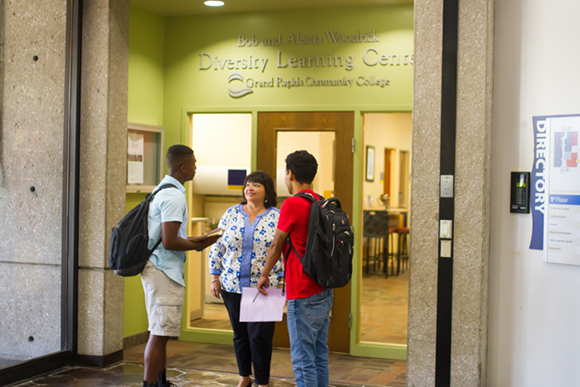 The new director at GRCC's Bob and Aleicia Woodrick Center for Equity and Inclusion is Domingo Hernandez-Gomez.